We fixed a lot of bugs. Please delete your browser cache and test again. Try TEST and delete your browser cache, first please. OK, I think we have to update the Database again. I haven't been able to logon to either Test or Dev as previously posted so shall I presume the testing is over? Beim Bild 1 hatte ich den gesamten Text, der in Bild 2 zu sehen ist schon getippt, in der Flash Version rutscht der Text nach. 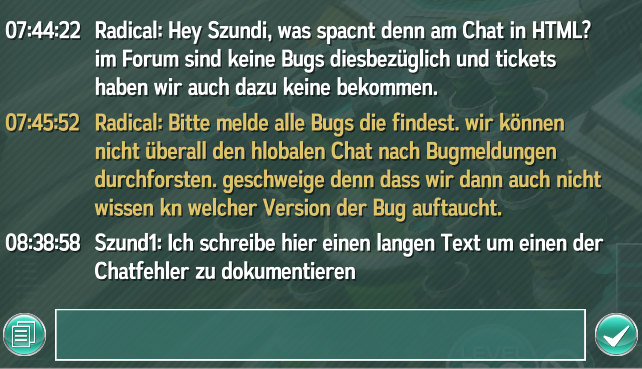 Die Uhrzeit im Chat ist 2 Stunden falsch, unabhängig vom Betriebssystem und Browser. 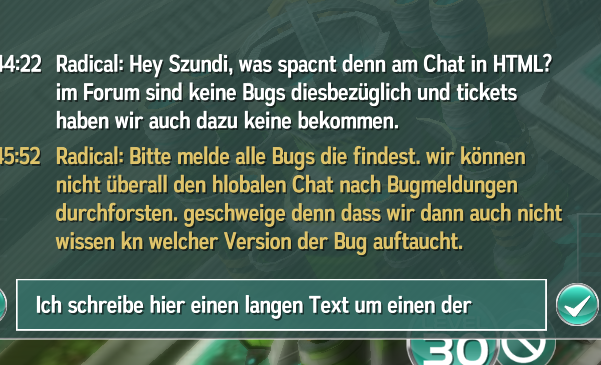 Am Freitag hatte ich das Problem, das meine persönlichen Chats gar nicht mehr aufgetaucht sind, die habe ich aber jetzt wieder. Uhrzeit sollte nun auch passen. Mit den Zeilenumbrüchen bei längeren texten, ist etwas kniffelig. Wir sind da aber dran. Bitte meldet weiter alles was euch an der HTML-Version stört. bzw. was anders ist als in Flash. - I was able to log in through armor games on a different computer using firefox. We will fix them asap. Btw. Armorgames Login should work now. - the exclamation does not show up in the store when it can be refreshed. I can not reproduce this. Are you sure this still happens? Could you please post or send me a screenshot which shows this issue?